VRF system (LG) with a balcony heat pump, and indoor fan coils for two zones. Packaged vertical unit (Magic-Pak) on a balcony, with electrical air conditioning and gas heating. VRF system (LG) with a rooftop heat pump, and indoor fan coils for two zones. 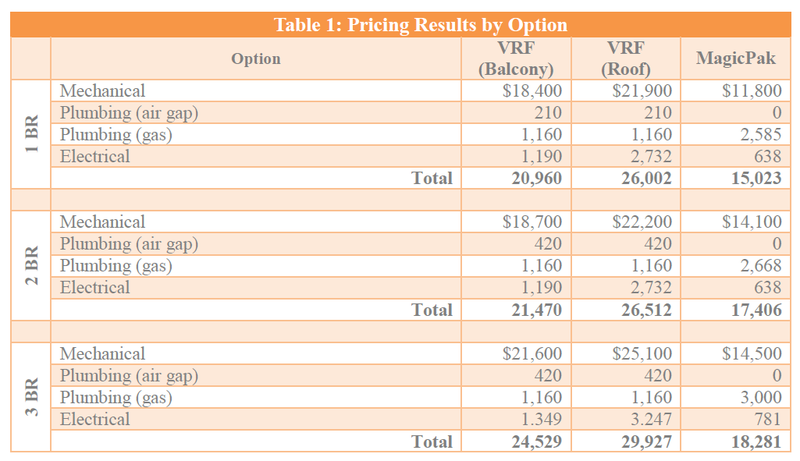 The rooftop VRF system is the most expensive option for the three apartment layouts, followed by the balcony VRF system. The lowest installation cost is achieved with packaged vertical units from the Magic-Pak M Series. The following table provides the mechanical, electrical and plumbing costs of each scenario in the case study. It is important to note that the table uses actual quotes from NYC contractors. The VRF options use heat pumps and fan coils connected with long refrigerant lines, while the Magic-Pak unit consolidates equipment and eliminates refrigerant connections. The Magic-Pak unit requires no condensate drain connections, since it uses a floor drain on the balcony. The VRF systems require separate electrical circuits for heat pumps and fan coils, while the Magic-Pak unit only uses one circuit. The rooftop VRF system has the highest electrical cost, due to the length of the circuit powering the heat pumps. Since the Magic-Pak unit uses gas heating, it comes with higher gas piping costs compared with the VRF options. However, these extra costs are offset by the savings in all other MEP installations. 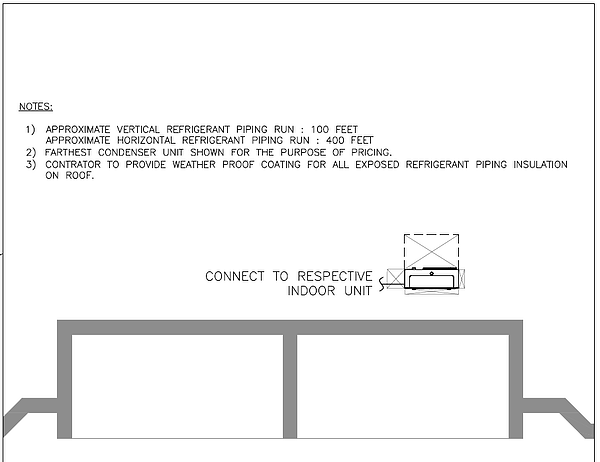 Gas piping only serves a stove when the VRF options are used, hence its lower cost. The following sections provide an individual cost comparison for the mechanical, electrical and plumbing installations in each of the scenarios considered. 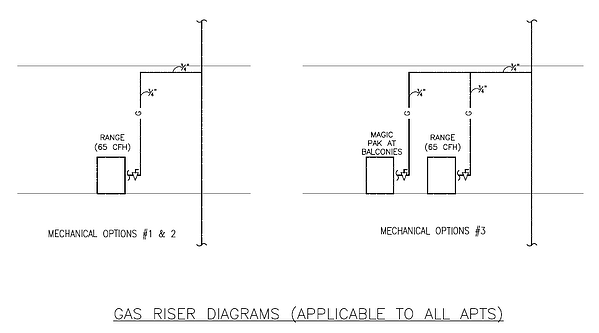 The following drawings show the mechanical equipment locations for the VRF system with heat pumps on the apartment balconies. The outdoor heat pumps are labeled ACCU (air-cooled condenser unit), while the indoor fan coils are labeled AC. Figure 01. 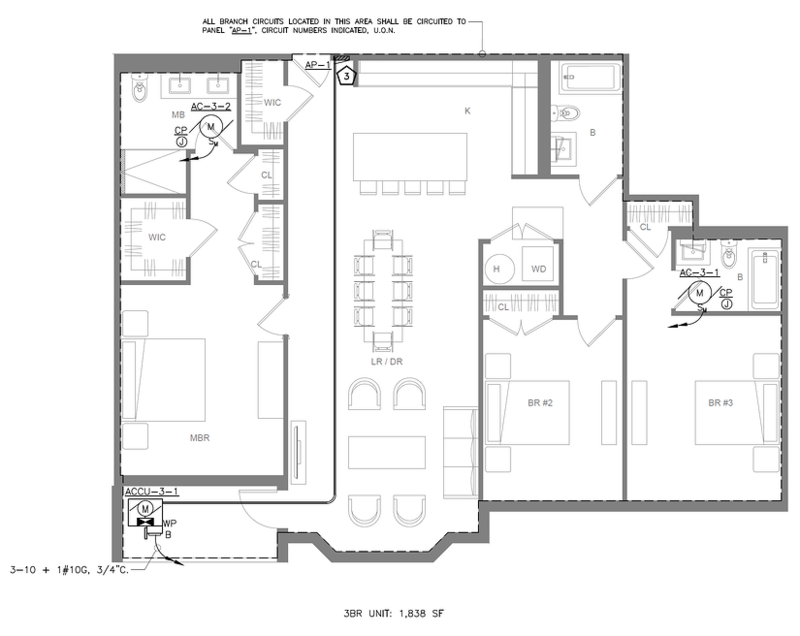 Mechanical equipment locations in 1- and 2-bedroom apartments, with balcony VRF system. Figure 02. 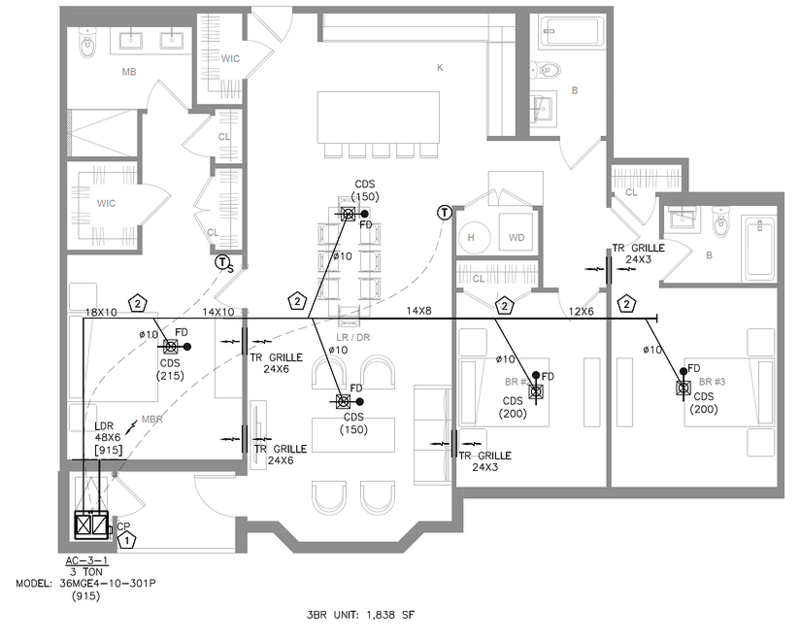 Mechanical equipment locations in 3-bedroom apartment, with balcony VRF system. In all three apartment layouts, the VRF system uses an outdoor heat pump and two indoor fan coils. Indoor equipment locations are the same in the rooftop VRF option, but the system becomes more expensive because refrigerant lines and electrical circuits are longer. Figure 03. Heat pump installation details, rooftop VRF system. Figure 04. Mechanical equipment locations in 1- and 2-bedroom apartment, with Magic-Pak. Figure 05. Mechanical equipment locations in 3-bedroom apartment, with Magic-Pak. Since the Magic-Pak installation uses less equipment and is more compact, it has the lowest cost among all three options. Consider that a compact installation achieves not only equipment and material savings, but also skilled labor savings. Although the mechanical installation represents most of the project scope and cost, there are also significant differences between the electrical installations in each option. The Magic-Pak system also has the lowest electrical costs, requiring only one circuit, while the VRF options require three circuits. Figure 06. Electrical installations for 1- and 2-bedroom apartment, balcony VRF system. Figure 07. Electrical installations for 3-bedroom apartment, balcony VRF system. The heat pump circuits become even longer with the rooftop VRF system, since they must reach the location indicated in Figure 03. Although the conduit and wiring sizes do not change, the electrical installation becomes more expensive due to the extra distance traveled. When Magic-Pak units are used, there is no need to install separate circuits for fan-coil units. The installation uses a single circuit between the apartment load center and the packaged HVAC unit in the balcony. Electrical costs for all nine scenarios are compared in the following table. The Magic-Pak option eliminates the condensate drain connections between fan coils and sinks, reducing plumbing costs. Since the packaged units are installed on the balcony, they use a simple floor drain. Gas piping is the only part of the project that becomes more expensive, since the Magic-Pak unit specified uses gas burners for space heating. On the other hand, the VRF heat pumps run only with electricity in both modes of operation, and the stove is the only piece of equipment that consumes natural gas. Figure 08. 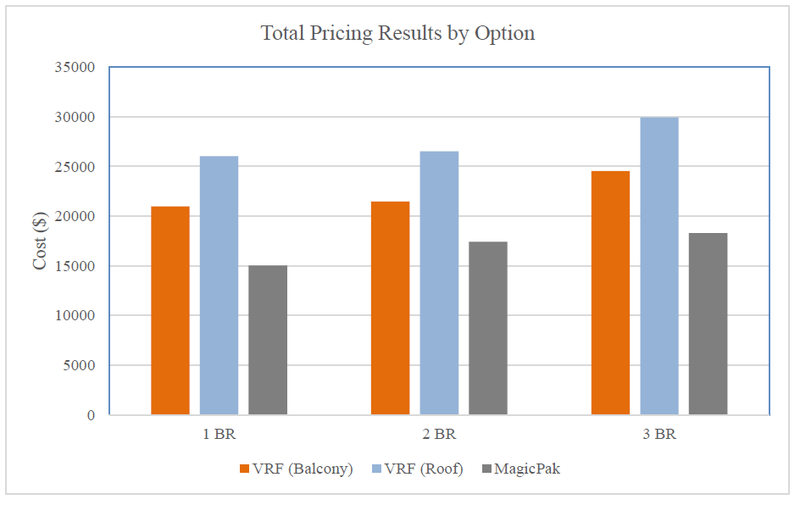 Cost comparison for the two VRF system configurations and Magic-Pak. In this case study, most MEP installations have a lower cost when packaged vertical units are used. This happens because mechanical equipment is consolidated, using only one electrical circuit and one floor drain per apartment. The only part of the project that becomes more expensive is gas piping; Magic-Pak units use gas heating, while VRF heat pumps use electricity for both heating and cooling. 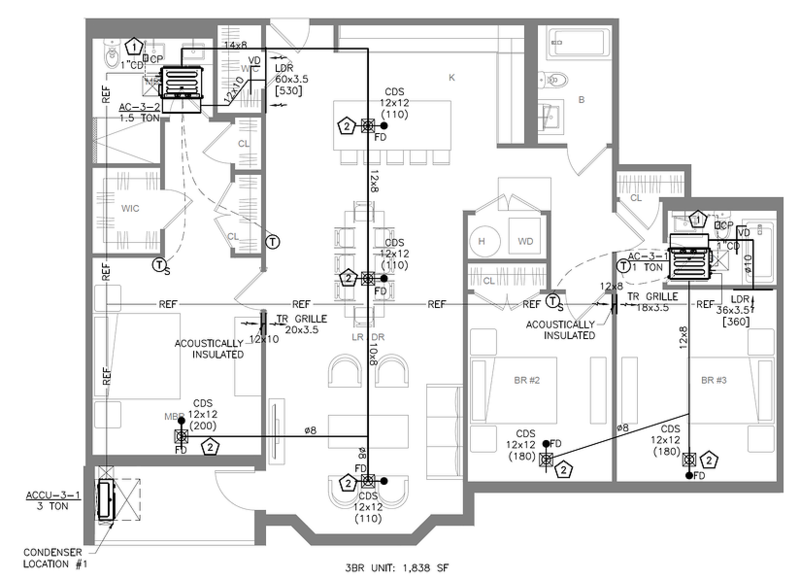 A professional HVAC design is the first step to get reliable cost information for a project. Once a detailed design is available, contractors can provide accurate quotes for the HVAC project. Cost estimates based on rules of thumb are not recommended: they lead to oversized equipment that is more expensive than necessary, and system components are easily missed without an adequate design procedure.